Wenckebach Video With Justin Timberlake: A YouTube Classic! If you aren't a medical student or fan of cardiac physiology, this Diagnosis Wenckebach video won't make much sense. Wenckebach describes a type of heart arrhythmia. It's an abnormal heart tracing that must be recognized by hospitalists, cardiologists and anyone else that must recognized concerning heart rhythms as part of their daily practice. 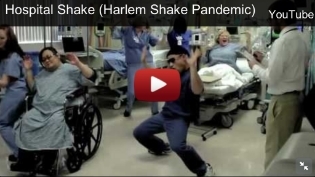 This YouTube video was made by a bunch of medical students from the 2010 University of Alberta medical school class. It's based on Justin Timberlake's song SexyBack and it is a masterpiece. I'm sure it is destined to be a cult classic. I'd pay good money to see electrophysiology cardiologist extraordinaire Dr Wes do some of those moves like those professors did at the end of the video.